The Full Contact Karate kicks off its second season with a live show scheduled for January 24 at the Avalon Hollywood in Los Angeles, CA (Jan. 25 AEDT). Danny Trejo, Bas Rutten, Sean Wheelock, and Faze Sensei are the hosts of the event dubbed as pursuit of “The Golden Belt”. “The full contact karate competition will take place in front of a live VIP audience with ring announcing by action film superstar Danny Trejo. Commentary will be provided by combat sports hall of famer Bas Rutten and fight expert Sean Wheelock, YouTube star Faze Sensei will provide vlogs and behind the scenes content, and Rosci Diaz (106th + Park, Entertainment Tonight) will host the red carpet,” reads the announcement the organisation sent out Saturday. 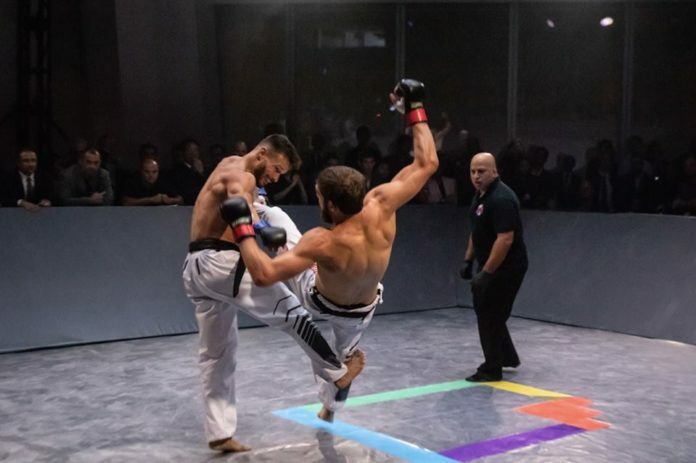 Adding the pursuit of “The Golden Belt” to the season, Karate Combat: Hollywood is the first promotion held this year. It is featured on the ten-event schedule across four continents. The event calendar can be found on Karate.com. The roster of the upcoming show features the representatives of eleven countries, such as USA, Brazil, Russia, UK, Scotland, Serbia, Portugal, Spain, Ecuador, France and Kyrgyzstan. Top of the bill is a lightweight “Challenger Match” between Brazilian Luiz Rocha and Russian Myrza Tebuev. The winner of the contest receives a chance to win the division’s Golden Belt. In the co-main event English Jerome Brown faces the representative of the country-host Abdalla Ibrahim. The lineup also includes Elhadji N’Dour of the US, who has won at Karate Combat events in New York and Miami, up against the debutant out of Scotland Calum Robb, as well as French Nadege Ait-Ibrahim faceoff Brazilian Ana Luiza Ferreira de Silva. A complete lineup can be found below. Forget everything you’re doing and Mark your calendar! You DON'T want to miss this ? The event begins at 10pm EST / 7pm PT and can be watched for free on https://t.co/M1EvqrWD6t and on Facebook and YouTube. ?? ?